Sehome won its fourth consecutive 2A Scholastic Cup championship. The Lyncs girls' soccer team helped by claiming the state academic title. Photo courtesy: Sehome High School. The Washington Interscholastic Activities Association announced its annual Scholastic Cup champions – one for each of the six high school classifications. Two of the recipients call Whatcom County home as Sehome captured the overall title in the 2A ranks and Lynden Christian earned the 1A championship. 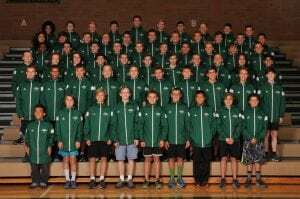 The Sehome boys’ cross country team joined the Mariners girls’ squad as 2A state champions this year. Photo courtesy: Sehome High School. The Scholastic Cup is a year-long competition which recognizes the top school in each of the six WIAA classifications (4A, 3A, 2A, 1A, 2B and 1B). The award is based on academic, athletic and sportsmanship excellence with points being awarded for a school’s finish in each of the athletic and academic state championships. The Mariners and Lyncs are joined by Camas (4A), Interlake (3A), Saint George’s (2B) and Almira Coulee Hartline (1B) as this year’s Scholastic Cup champions. Picking up a Scholastic Cup has become habit for Sehome, which won its fourth consecutive title and sixth overall. 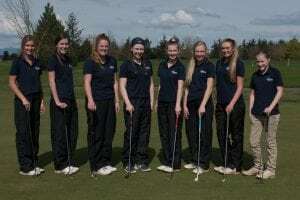 The Lynden Christian girls’ golf team captured the state academic title this year, helping the Lyncs win the 1A Scholastic Cup. Photo courtesy: Lynden Christian High School. The Mariners finished with 1,435 total points for the year, easily outdistancing runner-up Selah, which collected 1,140 points. Bellingham was third with 1,105, marking the Red Raiders best placing since winning the Scholastic Cup in 2014. Sehome’s final point count is the school’s second highest during its four-year run. The Mariners won Scholastic Cups in 2017 with 1,490 points, in 2016 with 1,380 and in 2015 with 1,425. Sehome now has six titles all-time, the most for any 2A program. Mercer Island (9), King’s (9) and Bear Creek School (8) are the only schools with more Scholastic Cups. Sehome won athletic state championships in both boys’ and girls’ cross country and academic titles in girls’ soccer. The Mariners received points in 12 athletic activities, including a second-place finish at state in boys’ tennis, and in 15 scholastic categories, where they finished second in state in band, boys’ golf and boys’ wrestling. 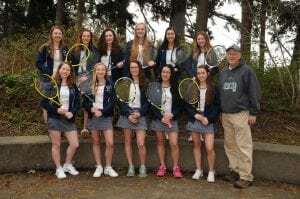 Squalicum won the girls tennis title in the 3A classification after the team finished with a combined 3.982 GPA – the highest for any spring sports team regardless of classification. Photo courtesy: Squalicum High School. Bellingham finished third overall in the 2A classification, highlighted by state academic championships in football and girl’s gymnastics. The Red Raiders were also state academic runner-ups in dance/drill, boys’ soccer and boys’ tennis. While Sehome registered its fourth straight title, Lynden Christian picked up its first 1A Scholastic Cup championship, winning the crown in lopsided fashion. Last year, the Lyncs finished second overall in the standings after Freeman edged Lynden Christian by a mere 15 points to claim the title. Things were not nearly as close this time around as Lynden Christian posted 1,500 points. Freeman was a distant second with 1,075, while King’s came in third with 895. 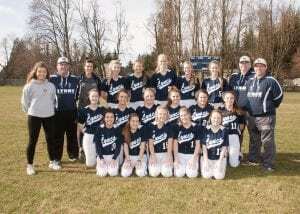 The Lynden Christian fastpitch team had a combined GPA of 3.780 – the highest among 1A programs. Photo courtesy: Lynden Christian High School. The Lyncs notched points in eight athletic events, led by state championships in both boys and girls basketball. Lynden Christian scored in 15 academic categories. The girls’ golf and fastpitch teams both closed out the spring sports season by earning state academic titles. The Lyncs had an average GPA of 3.886 for their girl’s golf team, while fastpitch finished with a 3.780. In addition, the Lyncs won state academic championships in boys’ cross country and orchestra and were second in state academically in band, choir, drama, girls’ track and field and volleyball. Sehome won its fourth consecutive 2A Scholastic Cup championship. 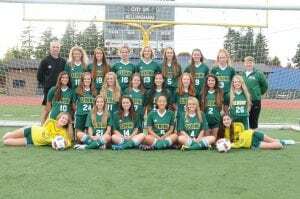 The Lyncs girls’ soccer team helped by claiming the state academic title. Photo courtesy: Sehome High School. Squalicum finished 12th in the 3A ranks. The Storm finished with a trio of state academic titles in girls’ basketball, girls’ soccer and girls’ tennis, which saw its 13-member team finish with a combined 3.982 GPA – the highest for any spring sports team regardless of classification.